George Curry was born on Prince Edward Island in about 1864. The family moved to Chadron, Nebraska and as a young man Curry became involved in rustling. He eventually formed a gang that included Harvey Logan. The two men were captured on 28th June, 1897, but managed to escape from Deadwood jail in November. Curry and Logan fled to the Robbers' Roost in Utah and joined what became known as the Wild Bunch. As well as the leader, Butch Cassidy, the gang included Sundance Kid, Ben Kilpatrick, William Carver, Laura Bullion, Elza Lay and Bob Meeks. Curry took part in several robberies including the raid on the Union Pacific train at Wilcox, Wyoming, on 2nd June, 1899. 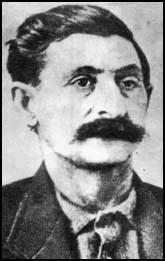 George Curry was killed by Jessie M. Tyler while rustling on 17th April, 1900. The following month Tyler was killed in retaliation by Harvey Logan.